Phase diagram of QCD matter. The QGP is reached at very high temperature. The interaction between quarks and gluons is described by the Quantum Chromo-Dynamics (QCD) theory. This strong interaction confines the quarks and gluons inside the protons, neutrons and other hadrons. When a hadron is torn apart, its constituting quarks and gluons, instead of being liberated, will recombine with newly created ones to form new hadrons with different properties. However, for very high temperatures QCD predicts the progressive reduction of the strength of the strong force and the subsequent deconfinement of the quarks and gluons. 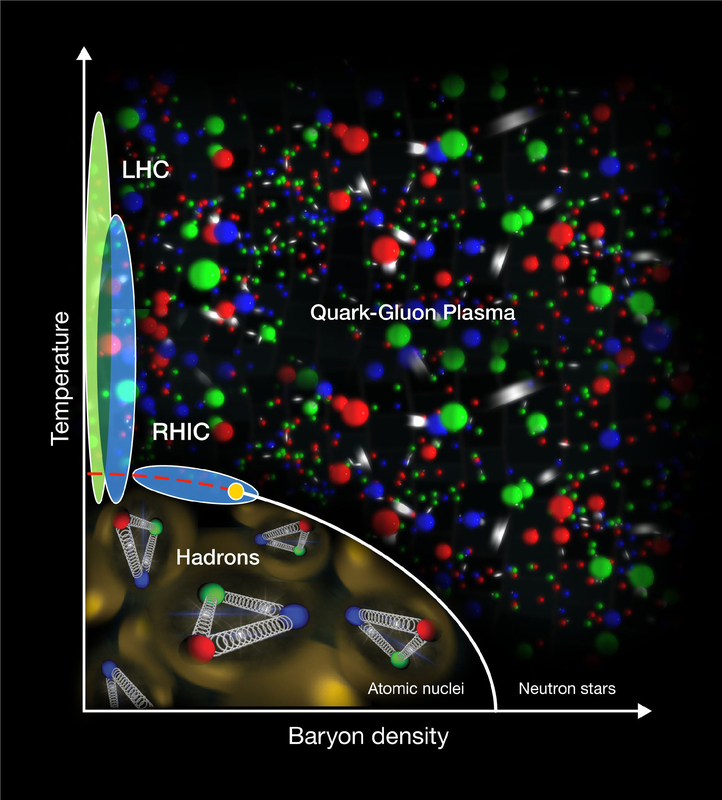 Matter will be in a new state of free quarks and gluons, the quark gluon plasma (QGP). Approximately a millionth of a second after the Big Bang the temperature of the Universe was about 100.000 times higher than that at the centre of the Sun. The necessary conditions for the presence of a QGP were met. The Universe has since then cooled down resulting in the hadrons that can be seen today. For the last thirty years several experiences have follow, looking to reproduce those conditions in the laboratory, from the SPS to the LHC at CERN near Geneva through RHIC at BNL close to New York. Heavy nuclei, e.g. Lead are accelerated to speeds close to the speed of light, enough to create in the collisions a QGP so small (about the size of a nucleus, 10-15 meters) and that cools down so fast (about 10-23 seconds after the collision) that it cannot be directly seen. Particle detectors are used to reconstruct the thousands of particles resulting from the hadronization of the QGP as well as those, called hard probes, produced at the very beginning of the collision, even before the QGP creation, which will therefore traverse it. The study of all particles produced by the collisions will allow to study the properties of the QGP. The Irfu focus on the study of quarkonium production. Quarkonia are rare and heavy particles composed of a pair of quark and its anti-quark, charm for the J/ψ and beauty for the Υ. The quarkonia are amongst the hard probes traversing the QGP. The Irfu participated in the PHENIX experiment at RHIC and is now strongly involved in the ALICE experiment at the LHC.